Tom Clancy’s The Division 2 takes place seven months after the occurrences of the first Division game, where New York City was hit by a deadly virus epidemic. It was then that the Division, a unit of sleeper agents stationed throughout the city, was triggered into action. The Division was the US civilization’s last line of defense, which has been fighting to retain what little civilization remains from the riots and chaos caused by the virus breakout. That fight has dragged on into the timeline of The Division 2, where chaos now reaches the nation’s capital, Washington D.C. 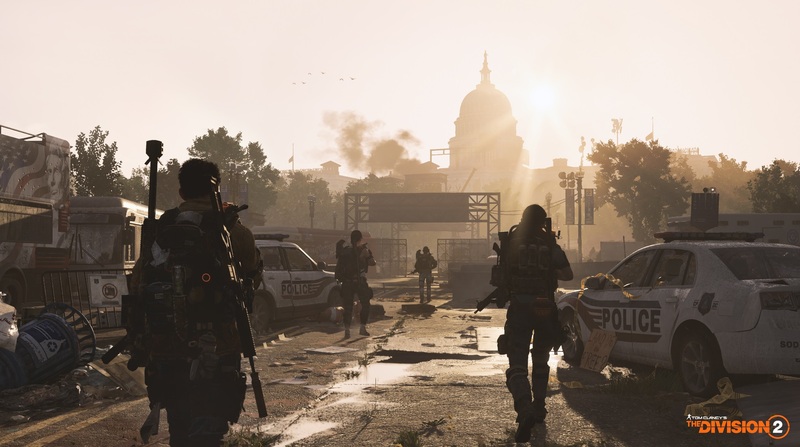 In The Division 2, you play as a Division agent that has been active on the field for those same seven months, as you and your team struggle to keep the nation’s capital from falling into anarchy. Like the first Division, Tom Clancy’s The Division 2 is an online open world which plays as a 3rd person shooter RPG. Your Division agent is again customizable down to skills, armor, appearance, and weapon loadouts, where even the weapons themselves can be customized further with scopes, grips, etc. You can opt to play alone or in a team of up to four players throughout the game’s various modes. Such modes include the campaign, PVP matches, or the infamous and returning Dark Zone, the staple “Wild West”, anything-goes mode of the Division. Also like the first Division, in The Division 2 incorporates primary and secondary gun slots, whose available weapon options are interchangeable between the two slots. You also get a pistol slot, a grenade, and two skill slots for your various character classes. New to The Division 2 is the inclusion of the new Signature Weapon slot, which houses a power weapon determined by your Division agent’s specialization. Now while it was just a demo, and any of this is subject to change, let’s go over what we got to see and play at E3 2018. 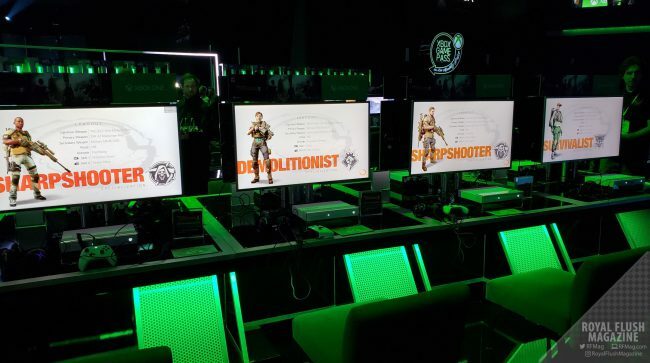 At the Xbox Showcase and Ubisoft Showcase demos, we got to choose from three class specializations: Demolitionist, Survivalist, and Sharpshooter. The Demolitionist’s signature weapon was the M32A1 Multi-shot Grenade Launcher and available skill was Hive. The Hive was a sort of throwable pack that could be tossed into enemy groups, deploying small insect-like drones to harass and damage targets. The Sharpshooter’s signature weapon was a TAC-50 C Anti-Materiel Rifle and available skill was the Assault Drone, which could be unleashed on enemies to attack them from different angles from the Sharpshooter. The Survivalist’s signature weapon was the Crossbow with Explosive Bolts and available skill was the Chem Launcher, which doused enemies with explosive vapors. I did enjoy the Demolitionist’s ability to harass enemy groups with both splash damage from the grenade launcher and general area of effect damage with the Hive. However, I particularly liked the Survivalist. The Chem Launcher required some timing to get down since once you tossed the Chem Launcher at enemies, it took a second or two to actually douse them with the chemicals. Nevertheless, I simply had too much fun firing the Explosive Bolts via the Crossbow at enemies. Unlike the intent of the grenade launcher, this particular signature weapon is intended to deal heavy damage to single targets. It became the obvious weapon of choice to use against heavier boss enemies or shielded enemies that happen to be flanking the group. Here’s our Survivalist gameplay, recorded at the Ubisoft E3 2018 Showcase. You get to peek at a quick little 4-player co-op demo created for E3, allowing players to get a glimpse of the new setting, Washington D.C. in disorder. †Tom Clancy’s The Division 2 screenshots taken from Ubisoft press site.